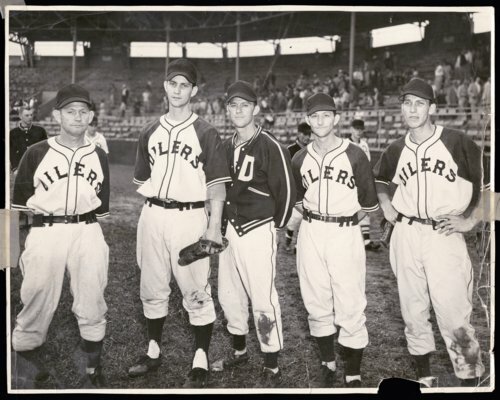 This photograph from 1953 features the five Coffman family members who played for the Topeka Decker Oilers semi-pro baseball team. Pictured are (l to r): Vern (Pooch) Coffman, Burton (Burt) Coffman, Abe (Junior) Coffman, Ed Coffman, and Harland Coffman. Vern, Junior, and Ed were brothers; Harland and Burt were Vern's sons. During the late 1940s and 1950s, the Decker Oiler team was a perennial contender for the state semi-pro title, competing each year in the state tournament held in Wichita. The team won the state championship in 1948, placed second in three consecutive years (1950-1952), and finished third in 1955 and 1957. Vern was the team's long-time manager, Ed was an outfielder, and the others were pitchers. Junior, Harland, and Burt all played in the minor leagues as well. Harland's minor league career was the longest - he compiled a 62-46 record while pitching for several minor league teams between 1948 and 1952. His best year was 1948, when he went 18-5 for the Independence (Kansas) Yankees, had a 1.94 ERA, and pitched a 7-inning no-hitter. Junior Coffman played with the Topeka Owls in 1946 and also pitched a no-hitter in a Western Association game against the Leavenworth team. Burt Coffman was a pitcher for the Carthage Cubs of the Kansas-Oklahoma-Missouri League in 1951. This photograph was likely taken when the team was in Wichita for the state tournament; it was published in the Wichita Beacon on July 19, 1953. Digital reproduction of the photograph was accomplished through a joint project sponsored by the Kansas Historical Society and the Shawnee County Baseball Hall of Fame.